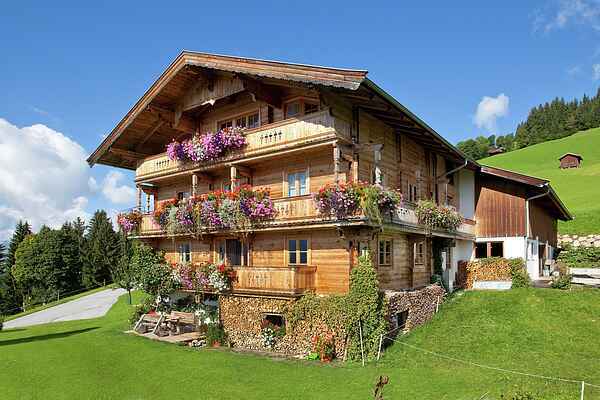 This is a beautiful and spacious apartment on the mountain with a magnificent view. It can accommodate up to 10 people on 75m² with 3 bedrooms and 2 separate bathrooms. The farm's name, Örgen, is derived from the term "Orgen". In its early years, the farm belonged to a Bishop named Georgius. "Orgen" is the colloquial version of the first name Georgius (Georg). Some of the young animals spend the summer on the "Kälbersalvenalm", the others on the pasture belonging to the farm. The farm lies 1050 m above sea level and is managed by the Schroll family. The Örgenhof is a certified organic farm, producing exclusively pasture milk. There are various animals to discover on the farm, such as cows, calves, hares, cats and chickens. If you ask, the homeowner will be happy to show you parts of the farm. Both in summer and in winter, this property is the ideal starting point to discover the region's activities. In the winter, the ski lifts are not far away, and in the summer you can hike to the reservoir within an hour, whereas it'll take two hours to reach the peak of the 'Hohe Salve' mountain.